© Celluloid on Demand. Powered by Blogger. 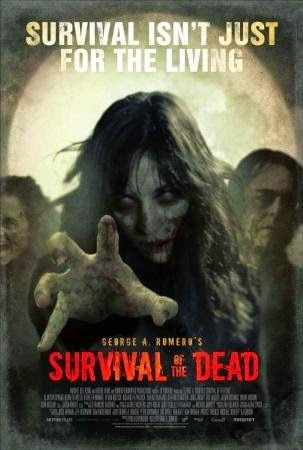 Survival of the Dead is the latest zombie film from the Master of Zombies himself, George A. Romero and is a continuation (a sidequel?) of his previous film Diary of the Dead. The Unnamed Army Leader from Diary, played Alan Van Sprang, returns, this time he to be identified as “Crocket” and be given a more humanistic portrayal. The film follows Crocket and his band of rouges as they meander the apocalypse and intercuts their story with that of dueling Irish families. These two families, the O’Flynns and the Muldoons, live on separate sides of the same island, and disagree on everything from career paths (collectively sailors vs. ranchers) to how to resolve the zombie problem (killing the zombies vs. containing them until a cure is found). Naturally, all paths convene. The film is a “return to form” for Romero whose Diary was received lukewarm reviews (though I not sure he "left"...). While Diary seemed a great concept (Romero commenting on the Blogosphere while using HD/YouTube amateurs shooting a “film with the film”), I will admit the actual resulting movie felt a little heavy-handed. While the “this is all being shot ‘live”’ concept was visually interesting and created some unique set pieces, losing that angle frees Romero up, and he is allowed to create much better set-pieces, action, and story. Particular action set-piece standouts include the suspense filled Dock/Barge sequence and a showdown at Zombie Corral. While the suspense and action are amped up in this film, the hit-you-over-the-head message is toned down… there is a voice over that explains Romero’s views, but Survival brings back a greater level of symbolism and subtlety to the story. The new film was better able to indict extremism without the super-explain-it-to-you montages of Diary. This film also uses moral ambiguity to a greater effect, as there are no clear cut “good guys.” I think the best compare and contrast that can be offered of the two films is this: Diary of the Dead allowed the form and construction of the film to dictate the story (which was a fun exercise to be sure). Survival of the Dead lets the construction of the film be dictated by the story. This film is a great and gory time at the movies. If you can catch it at a midnight/late night show with a packed audience, you will not be disappointed. Obviously recommended for Zombie and horror fans, but non-fans looking for an entry into the genre could do much worse. Copyright 2009-2018 Celluloid on Demand.